Libyan leader Colonel Muammar Gaddafi has again vowed never to leave Libya, the "land of his ancestors". The remarks came after the US recognised the opposition as Libya's "legitimate governing authority". Nato air strikes hit Tripoli's outskirts in one of the heaviest nights of bombing for weeks. "They're asking me to leave," he said. "I will never leave the land of my ancestors or the people who have sacrificed themselves for me." There was also a rally in Zlitan over the weekend, where up to 40,000 people - some of them bussed in - took over the main square to voice their backing for the colonel. 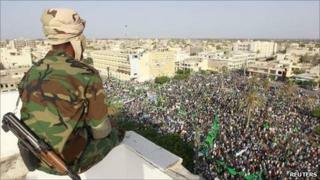 Early on Sunday, Tripoli's eastern suburb of Tajoura came under heavy Nato attack. Nato said the target was a military depot which ostensibily stored a fleet of vehicles for the African Union's peacekeeping duties. But surveillance indicated that Col Gaddafi ahd been using the fleet to sustain the war close to Misrata, Nato said.